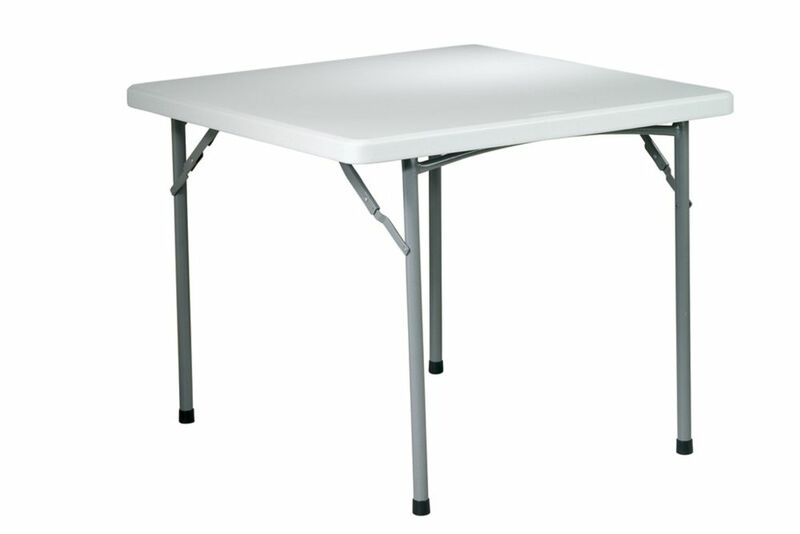 Perfect as a card table or mobile work station, this light weight yet sturdy multipurpose table is ideal for both home or office, and is durably crafted for either indoor or outdoor use. Featuring high quality resin that withstands up to 350 lbs, this 36 inch titan will stand firm with even the heaviest of items. Conveniently portable once folded into its space saving compact shape, this handle table is excellent for a multitude of uses. With non marring foot caps to keep your floors scratch-free, this one is sure to be tucked away and ready to go at a moments notice. Limited Warranty. Office Star Products warrants to the original purchaser that this product will be free from defects in materials and workmanship for a period of 10 years. For complete warranty details and exclusions visit www.officestar.ca. You can contact us at 1-866-382-9998 or parts.canada@officestar.net. Introducting Lifetime's new line of Premium Black & Silver Office Furniture. Our 6-Foot Commercial Folding Tables are constructed of high-density polyethylene and are stronger, lighter and more durable than wood tables. The innovative nesting design allows tables to fit snuggly together, and helps keep stacked tables straight and sturdy. This ingenious architecture saves 20% on the stacking height compared to previous models. Our tables are UV-protected with all-weather construction for both indoor and outdoor use. The patented steel frame design provides a sturdy foundation and is protected with a powder-coated, weather-resistant finish. Our High Strength Low Alloy (HSLA) Steel creates a lighter table with increased strength and stability. Built for the rigors of heavy-duty commercial use, Lifetime Folding Tables exceed challenging BIFMA standards and are backed by a ten-year warranty. 36-inch x 36-inch Square Resin Table Perfect as a card table or mobile work station, this light weight yet sturdy multipurpose table is ideal for both home or office, and is durably crafted for either indoor or outdoor use. Featuring high quality resin that withstands up to 350 lbs, this 36 inch titan will stand firm with even the heaviest of items. Conveniently portable once folded into its space saving compact shape, this handle table is excellent for a multitude of uses. With non marring foot caps to keep your floors scratch-free, this one is sure to be tucked away and ready to go at a moments notice. 36-inch x 36-inch Square Resin Table is rated 4.8 out of 5 by 47. Rated 5 out of 5 by Jim from Strongest card table I have ever had !!!!!!!!!!!!!!!... Strongest card table I have ever had !!!!!!!!!!!!!!! Rated 5 out of 5 by Joan from Sturdy. Easy to put up and down.... Sturdy. Easy to put up and down. Rated 5 out of 5 by Valerie from Great product! Sturdy and good quality. Husband uses it for... Great product! Sturdy and good quality. Husband uses it for a puzzle table. Rated 5 out of 5 by ECP from Best folding table I own. We use it on job sites, to keep the areas clean and organized. This t... Best folding table I own. We use it on job sites, to keep the areas clean and organized. This table is very sturdy and great for a work table, cut off table and storing tool bags on top and totes underneath. The table surface is very rigid (solid not flimsy) and the folding legs are heavy duty. Would highly recommend this table for any use. Rated 5 out of 5 by Corinne from The table was very strong and easy to set up.... The table was very strong and easy to set up.